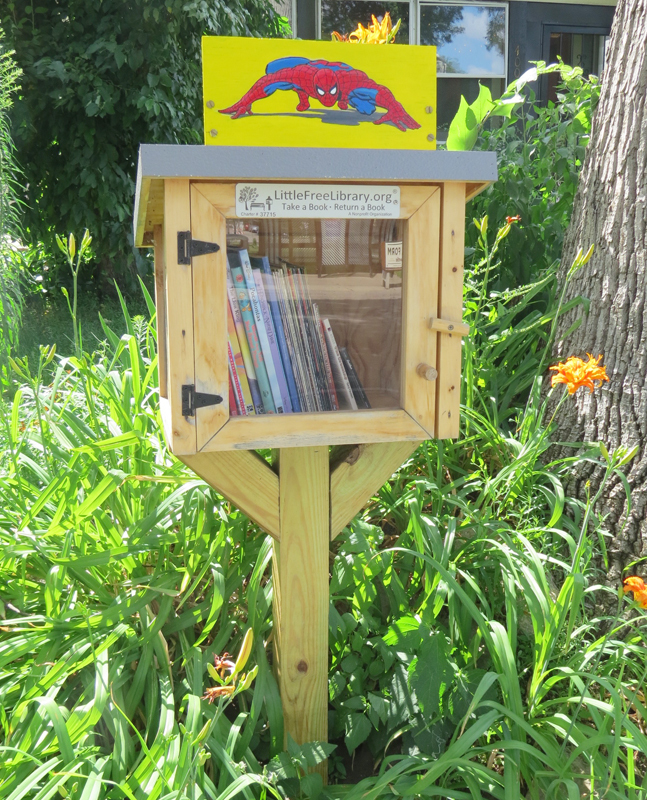 put together your very own Little Free Library! I’m purposely skipping over cutting the post and angle braces, as at no point during that whole process did I have a clue to what I was doing. 1: Having a table saw I could borrow from a family member sure was damn helpful regarding building the base. 2: I bought the wrong lag screws. Make sure to buy the right ones (not that I have a clue which ones that would be). And use power tools to secure them if you have weak little arms that aren’t accustomed to lifting more than a pencil and/or wacom stylus. Correct lag screws? Who knows! Make sure when finding a spot for your Little Free Library that you place it on an incline or small hill, that way you’ll have to dig even farther to make sure the hole’s deep enough. Also make sure to place it near a large tree so there’s plenty of roots to cut and dig through. 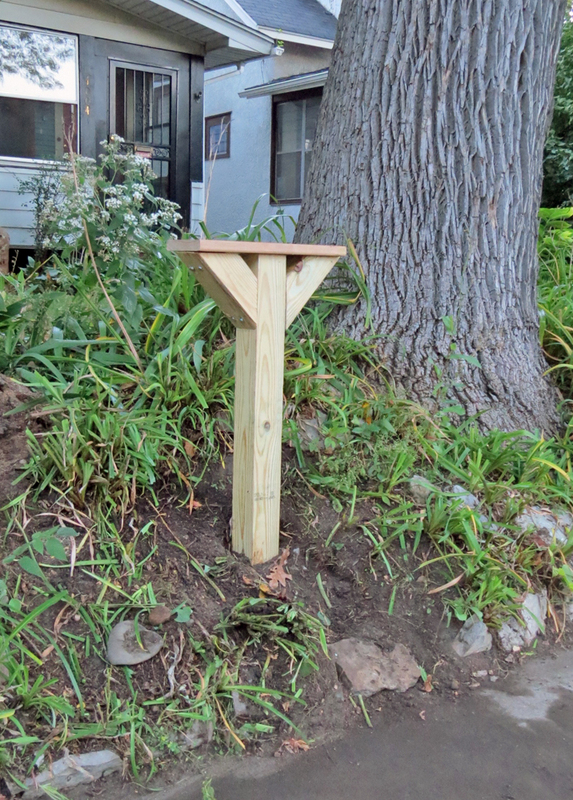 Make the decision to personalize your Little Free Library by adding a drawing to be mounted on top that you can’t find time to get to for months. Wait until the RealFeel is 25 below and THEN install the Spider-Man drawing on top. That way the wood will be as hard as concrete. 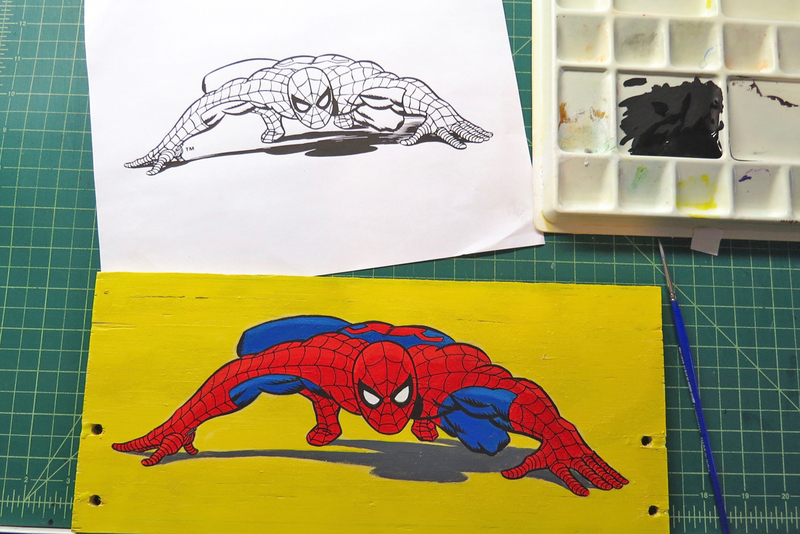 And yes, the two pics indicate a three month lag between library installation and Spider-Man drawing (once again – finding time). And there you have it – IT’S JUST THAT SIMPLE! For more helpful hints, find someone who actually knows what they’re doing. Spider-Man has taken some wear and tear over the last year and a half. 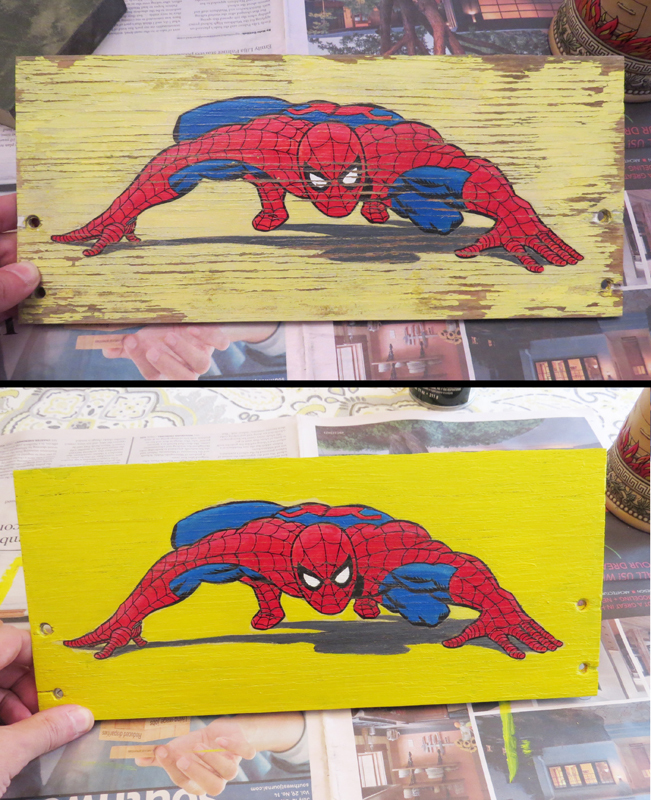 Next time I’ll have to pick up a better piece of wood to paint on, but for now it’s time for some touch-ups. I also needed to restock. 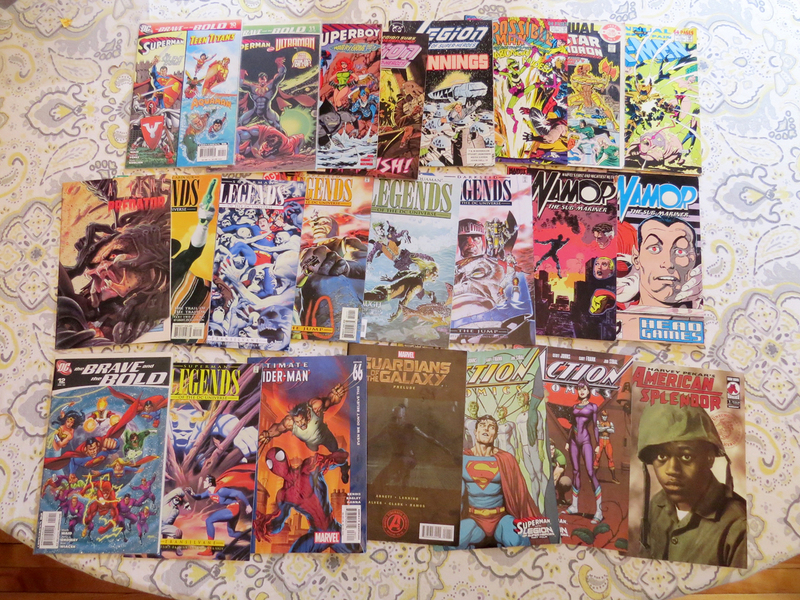 Half Price Books just had a tent sale, so I was able to get a pretty good haul for real cheap. And we’re officially back in business! 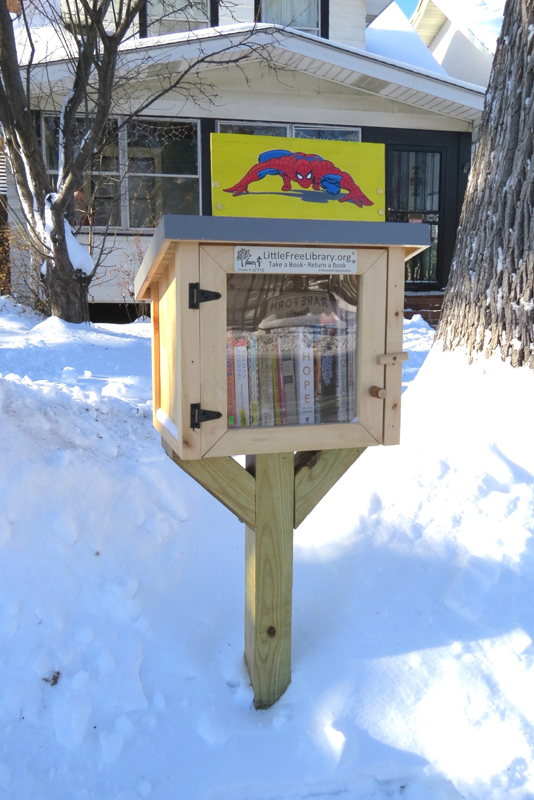 This entry was posted in Ramblings & Reviews and tagged Little Free Library, Spider-Man. Bookmark the permalink. Man, you have the best stocked little free library I have ever seen! Thanks! 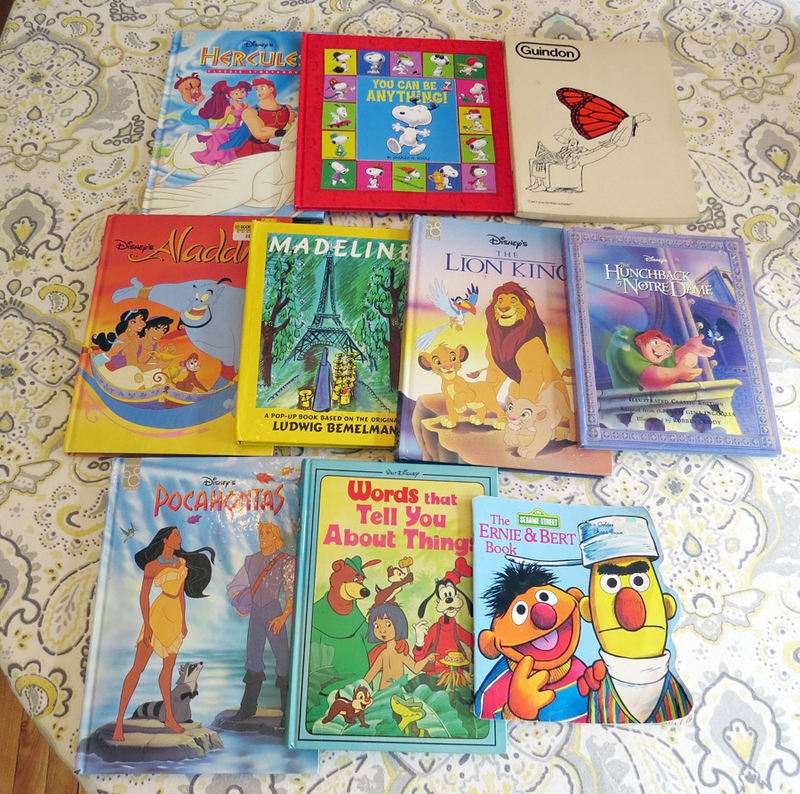 It comes from checking out other Little Free Libraries and finding nothing but old car manuals and decades old knitting magazines.